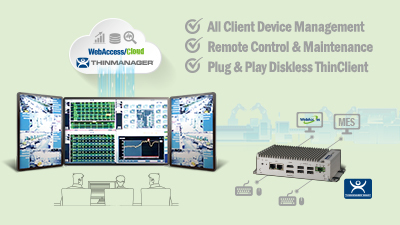 WebAccess, as the core of Advantech’s IoT solution, is the first Client/Server/Browser based configurable SCADA software. Through Advantech’s HMI/SCADA system, we can build up the foundation of IoT data management. In addition, with its open architecture, vertical domain applications can easily be integrated. In WebAccess+ solutions, WebAccess runs on a preconfigured Advantech solid hardware platform to collect field data from remote I/O devices and/or controllers via different communication hardware. Using vertical related algorithms, it presents the data in a remote web browser with a domain focused template. With this totally integrated product solution, vertical system integrators can take advantage of the fusion of the time proven Advantech hardware and leading edge WebAccess remote monitoring SCADA software to quickly deliver a reliable project to customers. Users can also enjoy the convenient, fast, cost-effective solution for remote management, diagnose, and maintenance. Advantech provides several powerful WebAccess Bundled Products to speed up your project implementation time and reduce managerial resources. El Grupo de Automatización Industrial de Advantech presenta una interfaz estandarizada para los servidores de dispositivos industriales, de la OPC (OLE for Process Control) del servidor. Un servidor OPC proporciona a los dispositivos, tales como un dispositivo de E / S, para comunicarse con una amplia gama de paquetes de software HMI / SCADA que residen en un host. Cualquier sistema de software con capacidades de cliente OPC puede acceder a los conductores del OPC del servidor de Advantech . Advantech provides Project Web Access Bundled Products, including Touch Panel Computers and UNO products, as SCADA server and HMI control systems. When purchasing these products, users will get a bundle of WebAccess/SCADA and WebAccess/HMI by Windows 7 Embedded/ Windows 7 Pro for Embedded Systems (WES 7 Pro) OS built in to Advantech’s robust hardware platform. This allows users to configure the applications on the hardware platforms. When the application is running on the SCADA Node, users can monitor and control the application locally or on another computer (Clientthrough the network. The SCADA Node hardware provided by Advantech can connect with Advantech BAS-3000 series, ADAM-2000 series, ADAM-4000 series, ADAM-5000 series, ADAM-6000 series and PLCs.